I've talked about demand destruction before in this blog. 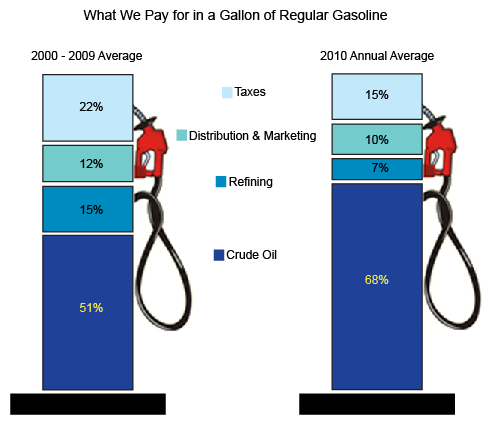 Demand destruction occurs when the marginal benefit of using more crude oil exceeds the marginal cost for people. 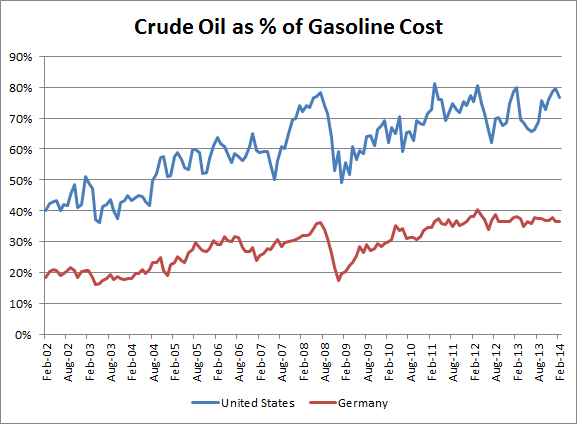 Essentially, when oil prices go too high, people use less oil. On a personal level, this means that people may drive fewer miles by staying closer to home on the weekends, they might postpone a long-distance vacation, or they might start taking the bus or work from home instead of commuting by car. The Economist wrote a nice article on this phenomenon last year where they stated "in the rich world oil demand has already peaked: it has fallen since 2005." When Americans see $4 a gallon on their neighborhood gas station's sign, the price of oil immediately becomes front-of-mind and they start changing their behavior. Already, there are signs that motorization in the US has peaked. 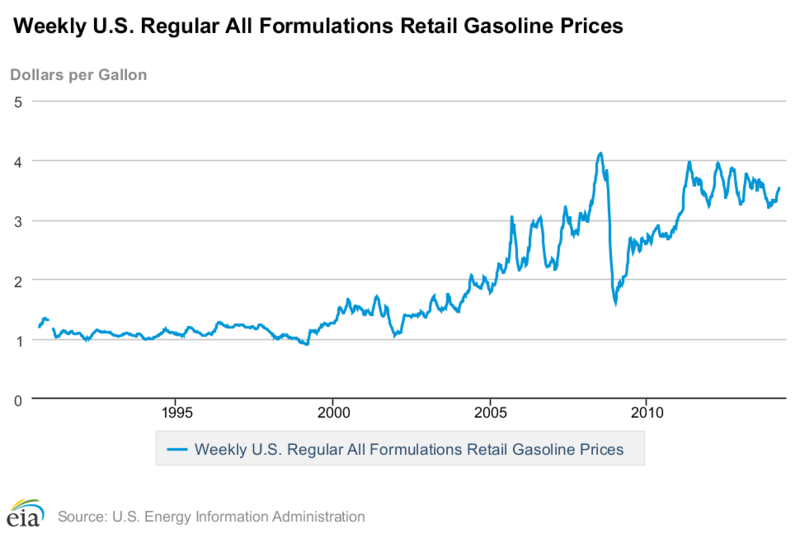 We can imagine that if gasoline prices rose past $5 per gallon, people would dramatically cut back on their gasoline consumption. 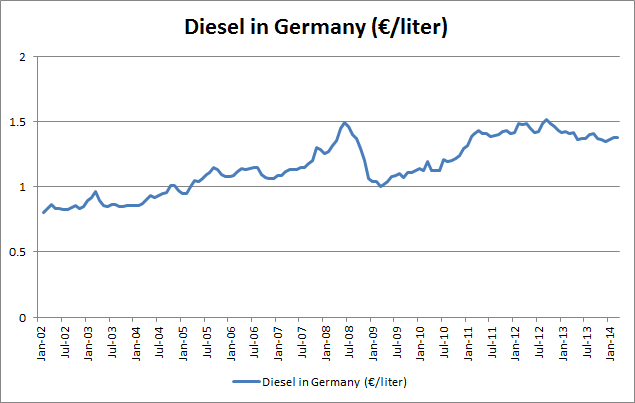 We can imagine that the next threshold in Germany is €2/liter, at which point Germans would almost certainly cut back significantly on their fuel consumption. In China, gasoline and diesel is priced in yuan/liter. Current prices are ¥1.77/liter for diesel in Beijing. In Chinese culture, many numbers have strong physiological associations. Seven a lucky number associated with "togetherness" - so today's price of ¥1.77/liter might be welcomed by people. Four is considered an unlucky number. In fact, many buildings in china don't have a 4th floor (similar to how many buildings in the west don't have a 13th floor). So while ¥2/liter is likely the next physiological threshold in China, we can imagine that if prices rose to ¥2.44/liter, they would be front-of-mind for people. For the record, there are more accurate ways of doing this - like calculating the refinery yield for each product and adding on top of that the taxes and distribution cost for each region - but for this blog post some rules of thumb will suffice. So looking at future prices, if crude oil hits $120-$125 per barrel, we will likely see demand destruction as certain psychological triggers are hit around the world. The next threshold appears to be $150-$160 per barrel, at which point demand destruction could be quite severe.